This card was made for a lovely lady. 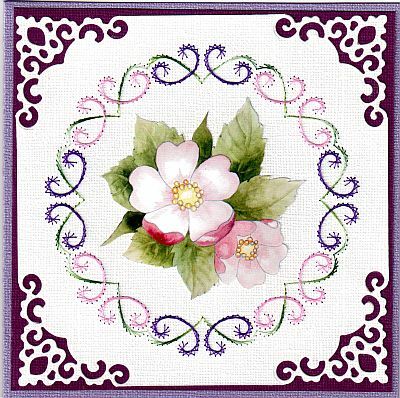 The pattern stitched is a422 from Ann's Paper Art. I have added a really cute House Mouse sticker in the centre, I thought that the little mice looked adorable. 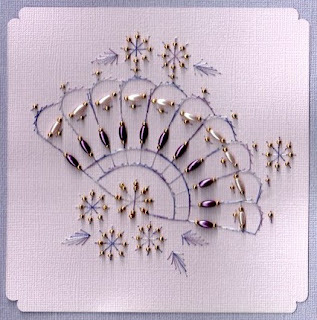 Gems have been added along the stitching. 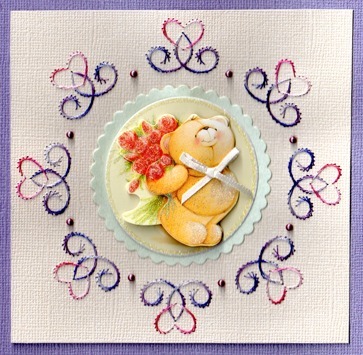 I really loved making this card as they are my favourite colours, I was really happy with the end result. 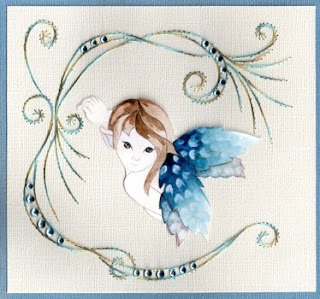 This card was made for a very special friend on Ann's Paper Art Forum. 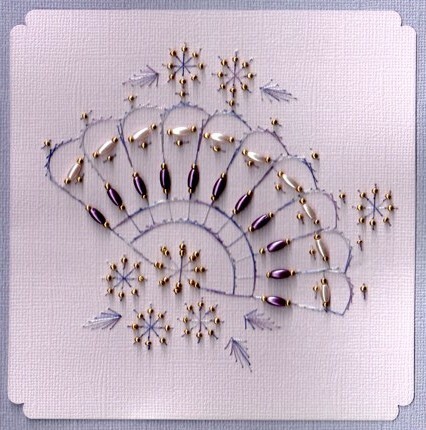 The pattern that I have stitched is a610 I have reversed the pattern so it goes all the way around the card. The decoupage is Forever Friends. 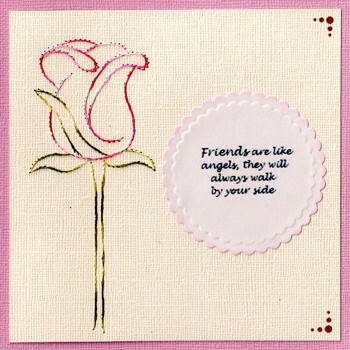 I made this card for another very special friend on Ann's Paper Art. 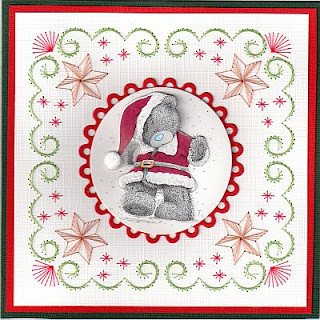 I used a Nellie Snellen die in the centre then placed a cute sleepy Tatty Teddy, decoupage on top. I have also added some pearls along the sides. This card was made for the November competition on Ann's Paper Art Forum. 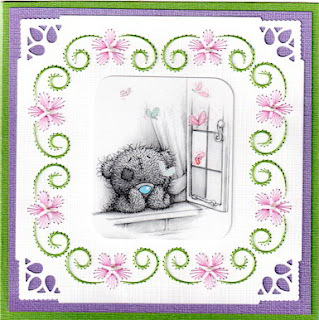 Again I have used a Nellie Snellen die with a very cute Tatty Teddy decoupage on top. 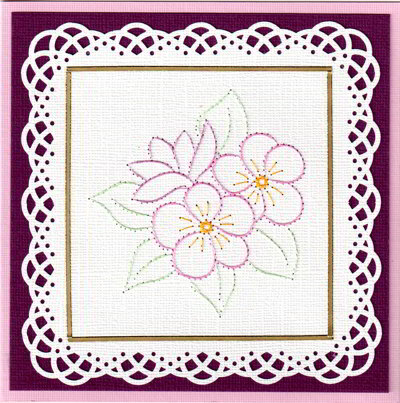 The pattern that I have stitched is a636. I have used a Forever Friends decoupage in the centre, this lady loves to bake. I have placed some jewels between the stitching. 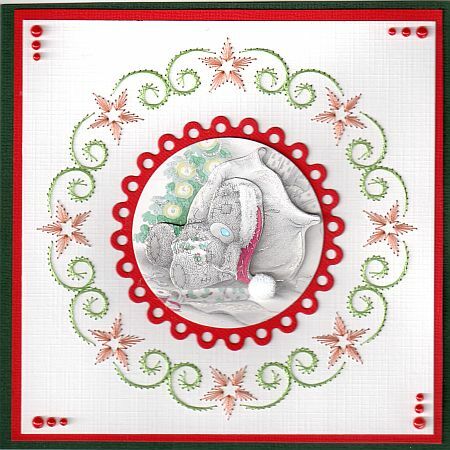 I made this Christmas card for a Hobby Friend in Holland named Carla. 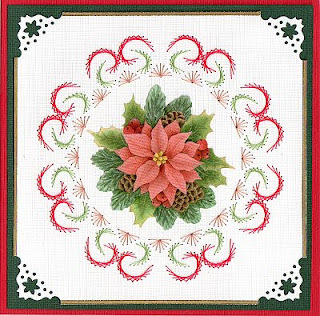 The pattern that I have stitched is from HJ 78 by Sjaak. The 3d image in the centre is by Wekabo #764. 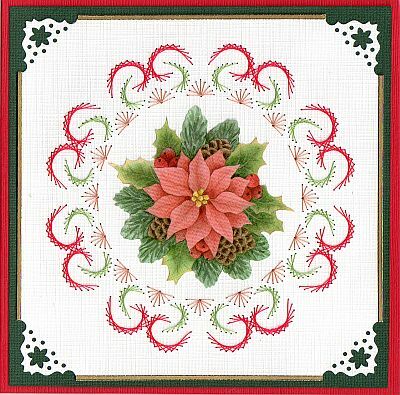 I have decorated the corners using a Martha Stewart punch , Poinsettia. I added gold peel off sticker lines along the sides. 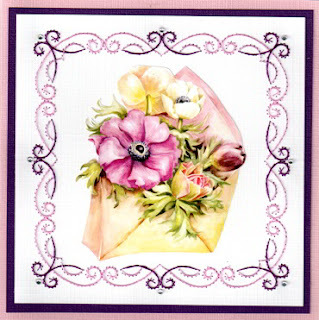 This card was made as a Special Secret Squirrel card on Ann's Paper Art Forum, the pattern that I have stitched is a363. 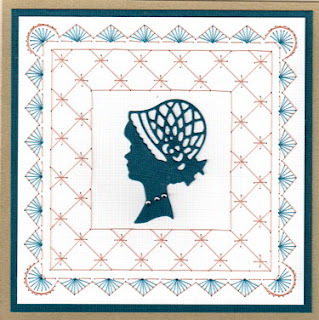 The image that I have cut out is a die by Marianne design LR0140, I have placed some lovely little gems around the neck to represent a neck lace. 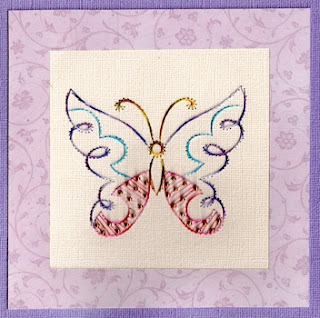 I really enjoyed stitching this card and I loved the way it all came together. 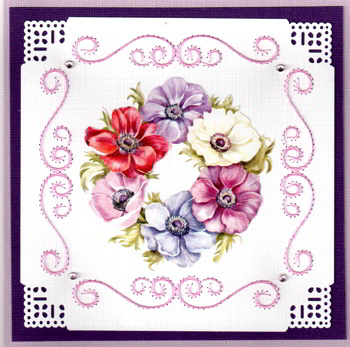 The following card is also a Special Secret Squirrel card the pattern that I have stitched is a099. 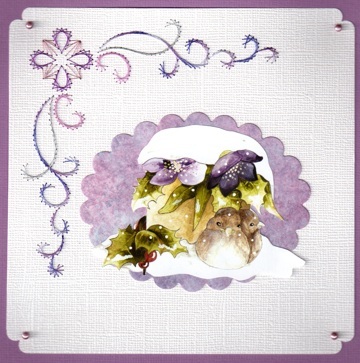 I have used a decoupage by Marieke's design. I have punched the corners and added some gems, I have used a peel of sticker by Starform. 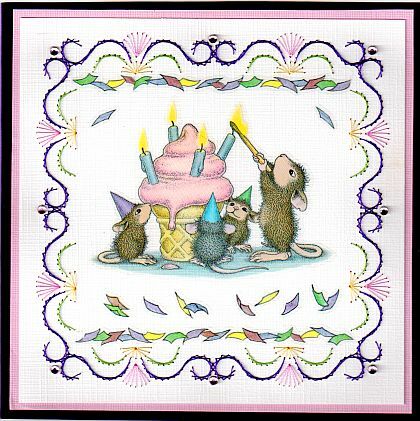 The following card is also a Special Secret Squirrel card, the pattern that I have stitched is a359. I have used a Tatty Teddy peel of in the centre of the card. I thought that he looked so cute, quite at home there. The corner punch that I have used is by Martha Stewart called Rain Drop. 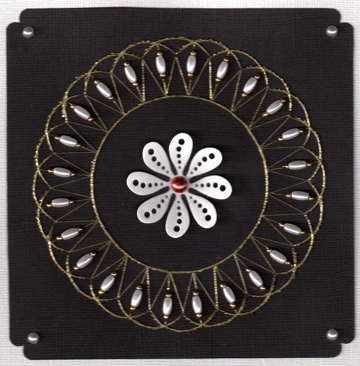 I have also added some pearls in the centre of the flowers. The following Special Secret Squirrel card I stitched was pattern a293, the decoupage that I have used is by LeSuh. I have added some gems in the corners of the stitching. 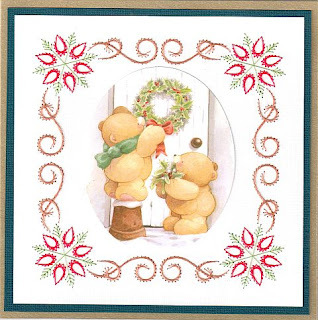 Again the corner punch is by Martha Stewart called Embroidered Floral. 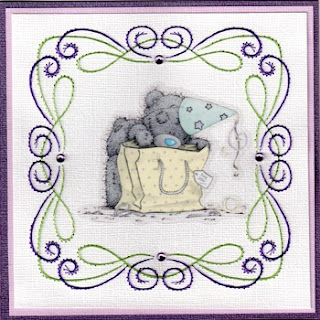 This Special Secret Squirrel card was stitch with pattern a093, I have added gems in the corner. 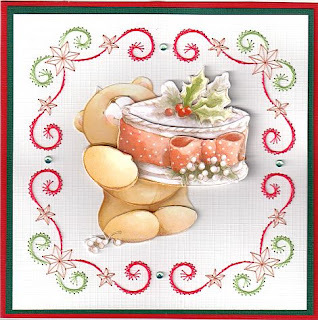 This Special Secret Squirrel card is stitched using a free pattern from Ann's Paper Art a100. 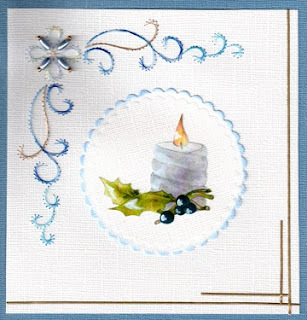 I have used Martha Stewart around the page punch called Swirling Lace. This is the first time I have used the punch like this and I am very happy with the results. I made this card for France's birthday she turned 60. 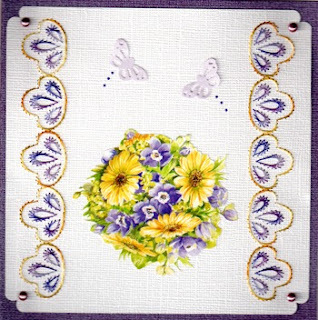 The pattern I have stitched is a931, the decoupage is by Marieke's Design. I have cut out the corners using a die by Nellie Snellen MFD027 on my Cuttlebug. 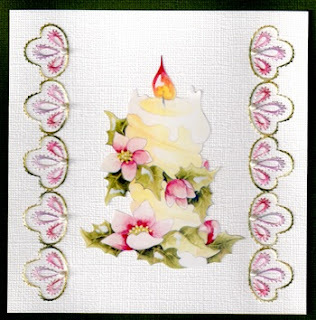 I made a birthday card for Ann from Ann's Paper Art, it was Ann's 50th birthday and she was very lucky to spend it in England. 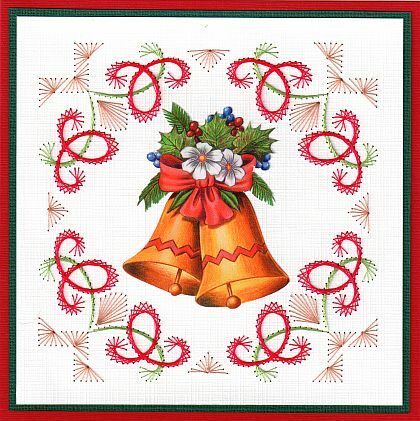 The pattern I have stitched is a626 and I have used a Forever Friends decoupage the corners have been punched using a Martha Stewart Punch called Scroll Lace. I have also added some lovely little gems. I made this birthday card for Karin, the pattern that I have stitched is a621 and I have put Tatty Teddy in the centre, I have also added some jewels. 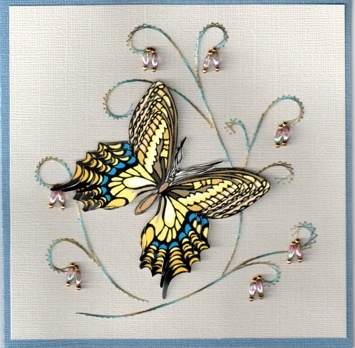 I have been extremely busy the last few weeks making cards on Ann's Paper Art Forum. On the forum we have been playing a game where you are not allowed to say certain words. The 4 words are known as banned words. If we get caught saying any of these words we are asked to make a card. Four of the cards were able to be used for private use and the other's were Secret Squirrel cards that we sent around the world. We did have sooooooooooooo much fun. My 1st punishment was to make two cards, using the same pattern which I selected. One was to be a Christmas card and the other to be a Birthday card. 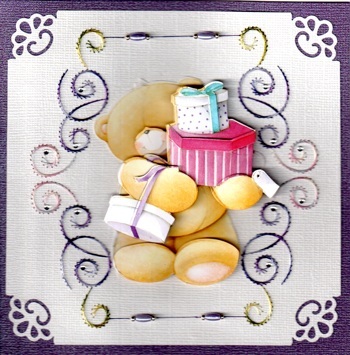 The 1st card is a Birthday card, the 3d image is by Mattie. 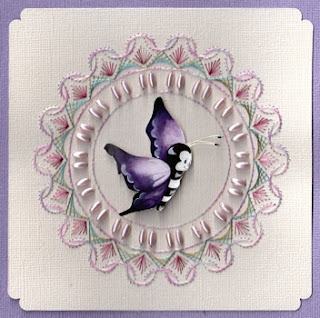 I punched out a butterfly with my Martha Stewart corner punch and then cut it away, I have also used pearls and Hobbydots to embellish the card. The 2nd card is a Christmas card and I have used a 3d image by Marieke's Design. 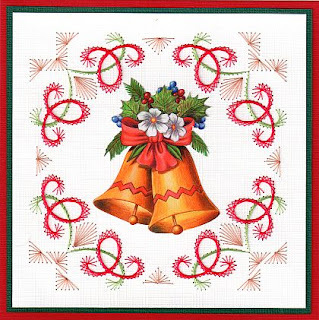 My 2nd punishment for the month was to make 2 Christmas cards using the same pattern. I have used pattern # a325. One was to be in Purple tones and the other in Blue and Gold. 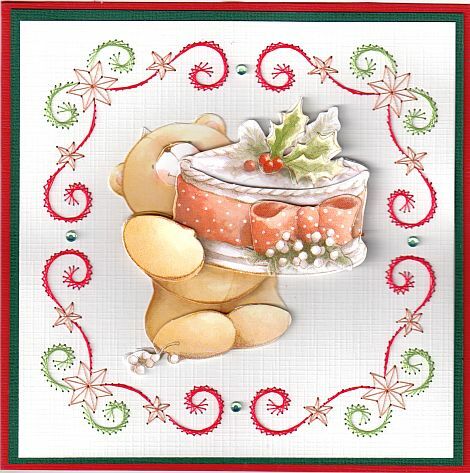 The 3d image that I have used on the cards are both by Marieke's Design. I really enjoyed stitching this Rose and I am very happy with the end result. Once again I have used Chrissie threads to stitch this beautiful Rose. 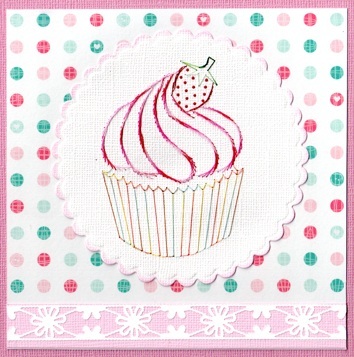 I have used a Nestabilities Scalloped die with a soft pink stamping pad around the edge just to add a bit of colour. I did the wording for the template on the computer. On the corners I have used Hobbydots. I have used a pattern that was designed by Karin Creations, KC012 Fly Away. I have added seed beads and rice beads, again I have used Chrissie threads. 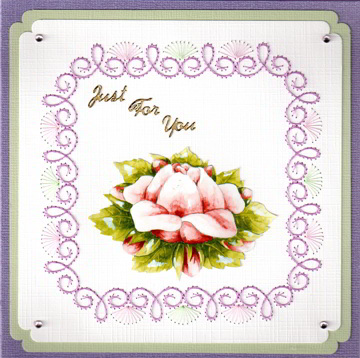 This card was made with another one of Ann's Paper Art patterns which was published in Hobby Journaal # 51. 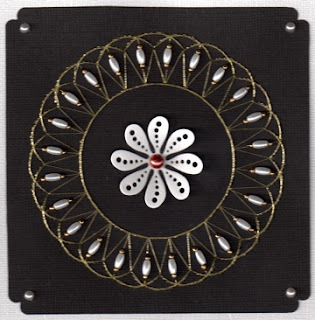 I have added rice beads in the corners and seed beads along the edges. 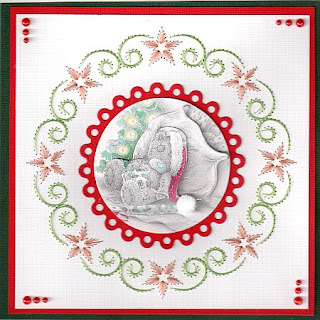 I have used Chrissie threads again and a 3d image in the centre. 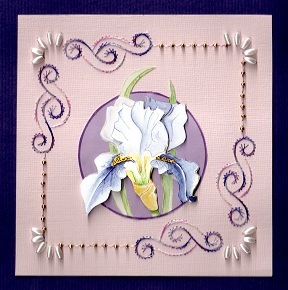 I have made this card using a April/May contest free pattern from Ann's Paper Art. 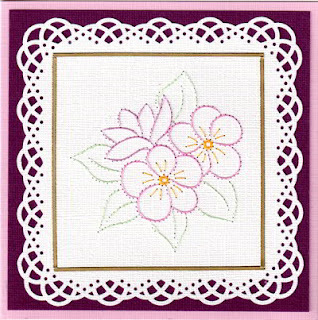 I have adapted the pattern which I found to be a great challenge.